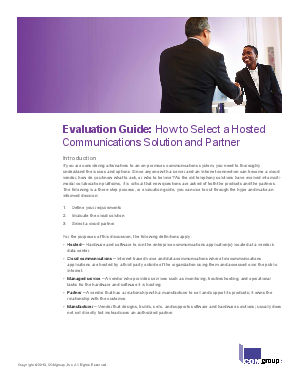 If you are considering alternatives to an on-premises communications system, you need to thoroughlyunderstand the issues and options. Since anyone with a server and an Internet connection can become a cloud vendor, how do you know what to ask, or who to believe? As the old telephony solutions have evolved into multimodal collaboration platforms, it is critical that new questions are asked of both the products and the partners. To learn more download this whitepaper. Compliments of Cisco.